We suspect that the word authentic raises your buzzword hackles, if you’ve heard it time and time again in reference to social media. Yet the words real and genuine, though they mean the same thing, don’t seem to carry the same punch to relay the importance of the qualities of your brand when engaging with your community online. Personality: Show some. Your audience engages because they feel invested in who you are as a brand or company. Are you fun and fearless or serious and savvy — or the one who brightens their day? Showing personality gives a glimpse of the people behind the brand. Honesty: Nurture it. Honesty goes hand in hand with the trust you’re trying to build. When someone in your community asks a question, respond to the best of your ability — and be truthful. If you don’t know an answer, promise to find out. Trusting you, they’ll come back to learn more. Return with an honest answer. Transparency: Give your social media engagement teams names and faces to create personal connections. 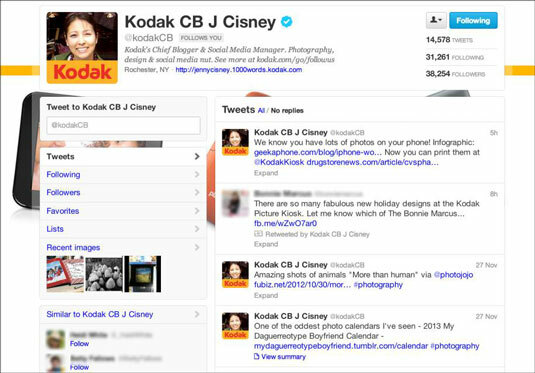 The Kodak account on Twitter, for example, is run by the company’s chief blogger and social media manager, Jenny Cisney. It’s her face you see when you communicate with Kodak on Twitter. When people know that they can connect with an individual behind your brand, your brand becomes personalized. Ownership: Take responsibility for your mistakes — they happen. Your community will judge you far more harshly if you attempt to act as though they don’t. Owning up to praise is easy. Also respond openly to your customers’ questions, concerns, and criticisms. Your greatest critics can become your most outspoken fans when they trust that you hear them and respond honestly and transparently. Use the word you when engaging in social media rather than refer to generic customers or people. Your audience prefers that you speak with them, not about them or at them. Make it personal.